The initial Phishing Security Test (PST) that shows the baseline Phish-prone percentage. Stepping all employees through our Security Awareness Training. Follow up with frequent PSTs that continue to keep them on their toes. All our customers' graphs start out high on the left (baseline), and drop dramatically over time. Employees get the understanding that each email could be a phishing attack and they need to STOP, LOOK and THINK for a second or two before they click on any link in an email or open an attachment. The monthly PSTs make sure that this behavioral change which was started by the training, actually gets reinforced and applied in their day-to-day office life. Check out the new phishing benchmarks by industry conducted in January 2018. 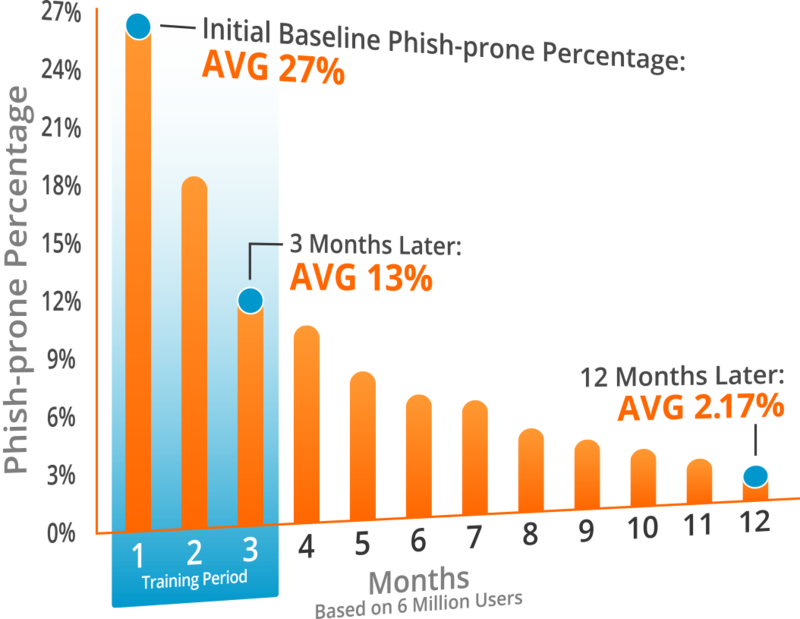 Start with doing your free phishing security test now and find out what your organization's Phish-prone percentage is.